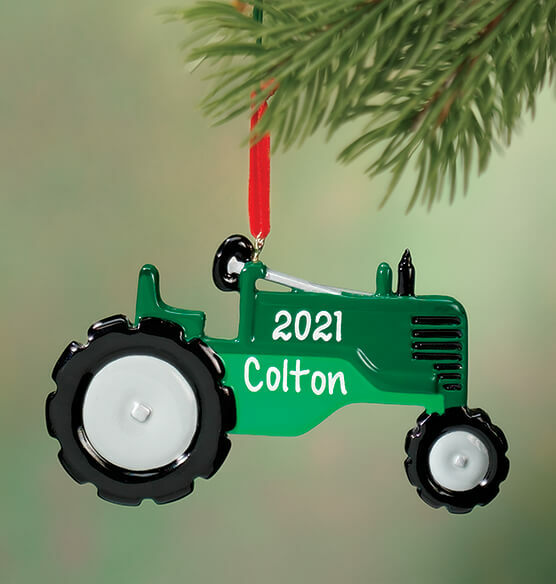 Personalized tractor ornament delivers holiday fun for your little driver! Tractor ornament is a rugged rig: bright, construction-inspired resin ornament is 4" long x 1/4" wide x 2 1/2" high. We'll custom detail with name and date. Specify year; limit 1 line, 4 letters/spaces. Specify name; limit 1 line, 7 letters/spaces. My son just loves tractors, so he was very excited to put this ornament on the tree...especially since it had his own name on it. The personalization on the tractor was perfect! My brother restores old John Deere tractors. He's restoring a '42 right now. The ornament was a big hit with him. He has it hanging on his shelving that holds his collection of model John Deere tractors. He's definitely not a child, but liked the ornament as one more reminder of his hobby. I bought this item as a Christmas present for my grandson. and can remember this in the years to come. Very cute and will be a great addition to decoration collection. Got this to represent my oldest great-grandson. He has a pedal tractor just like this which he loves. The colors are bright, the personalization is perfect and it is a size that will show up nicely on the tree without detracting from other ornaments. Bought this for a 2 year old who loves tractors. Saw this and thought of my friends son. He loves green tractors. He will love it!!! I ordered the tractor for my Christmas tree with my new grandson's name, birth month and year. It's the perfect size for my tree. It's so colorful and cute. I ordered it late and was worried that it wouldn't get here in time but to my surprise it came just in time! For my Great Grandson, a perfect remembrance of this Christmas. Nicer than I thought, really cute, nicely personalized. These sold out well before Christmas last year (2016), I almost forgot to order again this year. Ordered close to Christmas and it came before Christmas. Still appropriate this year, so glad it came. We're a John Deere family with big equipment that my grandchildren (6 and 10) have been riding forever. No toy stuff for them!! Will personalize the ornaments myself give to them for Christmas. Is a gift for our grandson. We try to pick something that reminds us of time we spent together.